It has been a while since I last posted on this blog. I have not been active on my Facebook page either. Why? I think because I am having trouble making sense of the world right now. I simply do not understand the hate and violence that are so pervasive at this moment. I used to think I understood people who express their anger demonstrably, because I used to manage my own anger so poorly. I thought I had some insight, based on my own struggles as a young man, when it was so easy for rage to rise up inside of me and spill forth. Maybe I did, but I don’t feel like I do anymore. I don’t understand most of the anger I witness on social media and on TV. On my worst days, when anger overwhelmed me completely, when I literally shook from the negative energy boiling up from deep inside, I never displayed such naked aggression, never verbally savaged another being, never even considered doing either. So I try to imagine what torment these angry people must be suffering, I try to put myself in their place, to contemplate their plight, to fathom what could possibly propel them to these states of frothing, thrashing, tearing, unbridled fury. But I fail repeatedly, fully unenlightened. I am left distraught by my confusion, by my utter inability to grasp what is happening in the world, in this country, in my own backyard. I cannot comprehend the acts of violence that take place every day, many times a day. I am even more confounded by the eagerness of so many people to act on their violent impulses, by their hair-trigger readiness to lash out with deadly force. I fear that I am despairing, losing sight of humanity’s inherent goodness, losing touch with creation’s core of love. I do not love my fellow beings any less, but I admit I sometimes wonder what good it does. Am I helping at all? Am I contributing, in any way, to stemming the angry tide? Could it possibly be any worse if I weren’t here at all? The sadness I feel is nearly unbearable. My heart aches for the beloved of the brutally murdered. Compassion continues to swell up even for the perpetrators, even though I don’t understand them, even though I believed that well had run dry, even though their acts are so repugnant and inexplicable that I begin to fear that my own loved ones are no longer safe. Today and yesterday and the day before, each brought more unwelcome news, more tragedy, more devastation. Unremitting, incessant, unflagging, unstoppable. At least it seems that way. Though I hope, I do, I really hope. And I do what for a Buddhist passes for prayer, and I cling to the possibility that the storm will be a little less fierce at dawn, and I focus on the inevitability of the sun rising, and I remind myself that the powerful, unquenchable power that fuels creation is still there. Love remains and, if we can manage to get out of its way, will prevail. I believe that, I honestly do, even now, even when it is so terribly difficult to make sense from any of it. Difficult situations are a barometer of the depth of one’s meditation and mindfulness practice and, conversely, a GPS that tells us how far we still have to go. (Technically, I guess depth would be measured with sonar and not a barometer, so sue me.) Reflection afterwards allows us to consider our behavior in the moment of the difficulty and provides insight into the role that our practice has played. Most days dish out the “slings and arrows of outrageous fortune” – or less dramatic and more commonplace indignities and inconveniences . Which means we have ample opportunity to put our practice into…um, practice, and to reflect on the results. I’m thinking about this right now because I am in the midst of a very difficult travel situation. I travel a lot and, consequently, encounter every form of travel mishap known to humankind. But this trip…oy. I was flying from Milwaukee to Denver, then on to Los Angeles. Bad weather shut down the airport in Denver and we were diverted to Casper, Wyoming. After more than two hours waiting in what passes for a terminal (three beverage vending machines and a nearly empty snack machine), we were loaded back onto the plane, only to discover there was a major mechanical problem. Off the plan again. It being a Saturday and we being in Casper, it would be three hours before someone could get there to make the repairs. By that time, the flight crew would be past its 16 hours and therefore not allowed to fly. We were stuck. So, I got to see downtown Casper. In the dark of night. Check off another state I’ve visited (using the broadest possible term for visit, obviously); only four states left to go. Maybe next time United will divert me to Honolulu. Stayed overnight in the Casper Ramada. Back to the airport for a 12:40 flight to Denver, 2 hours and 10 minutes after the flight I was rebooked on from Denver to Los Angeles. There are five more flights to LA after I arrive in Denver (presuming I arrive – I’m taking nothing for granted, considering it’s 12:25 right now and boarding has not begun – heck, I don’t even see a plane outside to board). I’ll be on one of them, right? Think positive! There was a time, not too long ago it seems, when this rigmarole would have set me off like a nuclear bomb. I would have ranted at everyone who would listen and everyone who tried not to. I would have acted as if the entire mess was a plot against me, as if I were being victimized. So here’s the amazing thing: I didn’t experience any anger at all. Not once did I think, “Why is this happening to me?” I didn’t fret over whether I’d make my connecting flight or when we’d hear an update from air traffic control. I admit to being a tad annoyed when the person at Enterprise told me, when I called to say I would be picking up the car today instead of yesterday, that my cost went from $191 to $327 – for one less day. I politely – seriously, I was polite – told him to cancel the reservation, and I called another company and got a cheaper rental. Okay, I also admit that, when we got back on the plane, and the pilot told us the bad mechanical news, I muttered under my breath, “Oh stop it.” I’m not sure who I was talking to. Other than that, though, I was a paragon of calm. That realization made me feel pretty good, I confess. I consider it a major silver lining to an otherwise fogged-in travel day to have recognized this measure of the benefits of meditation and mindfulness. Really, despite everything that happened, I am grateful for the epiphany, and thankful for a million other things that make me a very content, happy, and lucky person. Why not spend a little time at the Dharma Beginner page on Facebook, where a whole herd of people interested in mindfulness, meditation, spiritual growth, healthy living, and acting compassionately like to gather. And follow us on Twitter @dharmabeginner. That is what floated to the surface of my consciousness after he scored the winning penalty kick in the UEFA Champions League final last month. I’m glad the words did not actually pass my lips. But still, it’s the thought that counts, no? Is there any positive aspect to the word “hate”? To my mind, it is the antithesis of love, and love is the highest of callings, the calling that should be the basis of living. I was reminded by visitors to my Facebook page recently, when I wrote about anger, that good can come of anger. Further, anger in itself is not a “bad” thing, no more than joy is a “good” thing. It’s just an emotion, if a very powerful one. They were right, of course. But where is the silver lining in hate? What good can come of hate? Maybe one doesn’t like the way wool sweaters look on them, or the way they make one itch, or the way they smell if wet. But does anyone really hate wool sweaters? I mean, they’re inanimate! They should, therefore, be incapable of instigating such an emotion, shouldn’t they? I don’t really hate Didier Drogba. I’m a Liverpool FC fan, and he plays for Chelsea, so of course he frustrates me when he plays well at Liverpool’s expense. But I really know little about Didier Drogba, the person off the pitch. And even if I knew him intimately, what could possibly merit my hatred? Hurting me, my family, my friends? Is committing murder grounds for being hated? Multiple murders? Genocide? I lately find myself considering the idea that I should strive not to hate anyone. But how far can I take that before it appears heretical in some manner? Is it okay not to hate child molesters, but simply to be repelled by their actions and distressed for their victims? Is it okay not to hate Osama bin Laden, but disdain his terrorist acts and feel compassion for his victims and their families? Is it okay not to hate Hitler? I think you see where this is headed. I’m looking to the Dalai Lama’s example, specifically his attitude toward the Chinese government that has occupied his country for over 50 years, killed thousands of innocent Tibetans, imprisoned and tortured tens of thousands more, and attempted to systematically erase one of the most beautiful cultures on earth. Does the Dalai Lama hate the Chinese officials responsible for those atrocities? No. He prays for them, feels compassion for the suffering they experience that leads them to act as they do, and holds out hope that they will soon see the error of their ways. Is he naïve? Some think so. I don’t. I see his attitude as the apotheosis of “non-hate,” to coin a phrase. Or, as it is sometimes known, love. Some items recently posted to the Dharma Beginner page on Facebook, www.facebook.com/dharmabegin. “Love is the only force capable of transforming an enemy into friend.” ~ Martin Luther King, Jr.
I’d like to pass along one of the most valuable pieces of advice I’ve ever received: If you are angry at someone, if you think of them as your enemy, pray for them. You cannot remain angry at someone you pray for; someone you pray for… cannot long be considered your enemy. my own experience has borne this out. Somewhere along the line I learned to practice putting myself in the shoes of those who would hurt me or make me their enemy. I usually need to let the hurt subside first, but when it has I can ask, “Why would they do this thing to me? What suffering must they be enduring that leads them to act in this manner?” Then I remember that everyone wishes to be free of suffering, friends and foes alike, and I pray that they will be free of suffering. Sometimes I can manage to say those prayers with the sincerity of someone praying for a loved one or dear friend. Other times it takes a little more time, a little more distance from the pain. But once I pray sincerely for them, the hurt and anger melt away, and all that’s left is compassion. How Do People Perceive Me? In retrospect, it makes me laugh. There really should be some LOLs here. It seems so silly. Why should I care what it says on my tombstone? I’ll be dead. But in that moment, it still brings me up short. I think it’s right to take seriously what kind of world I leave behind, but not because of how I’ll be remembered for it. Because I believe it is my responsibility to leave behind as much love as I found when I entered it, and hopefully more. 4. We are committed to growing ethically, spiritually, emotionally, etc. I’m certain the list could be longer. But if you and I can agree on just one of those, that’s a great place to start building a friendship. I’d like to think that I could build such a friendship with each and every one of you. A little less than a year ago I wrote here about how I learned a life lesson about disappointment. I had traveled across the country to see the Dalai Lama for the first time and to participate in an initiation he was conducting. His physicians asked him to rest an extra day before traveling from Tokyo to California and as a result he missed the event. I spent one night angry, sad, and disappointed, and then spent the next day begin taught about humility, compassion, and real suffering and disappointment. I knew right away what an important event that was, and one year later I can confirm that it was life-changing. For one thing, my practice shifted in tone and pace. I stopped being in a hurry to reach enlightenment. I began to focus on the present moment and where I was on the path at that time, rather than craning my neck to see what was coming up around the bend. I learned to appreciate what I was doing and experiencing at any given moment, instead of counting up the things I’d done or the things I wanted to do. I stopped trying to accumulate experiences and knowledge (though, to be honest, I haven’t stopped collecting books—my love of reading and learning continue to overpower my will and overtax my shelves). I also started to get over myself. As deeply spiritual as my life has been at many times, both as a Christian and a Buddhist, I think I sometimes have been a tad too impressed with myself. Despite feeling somewhat lost exploring my path as a Buddhist, I still managed to inflate my spiritual self-importance. I was a bit too proud of the new spirituality I was developing, of the experiences and knowledge I was collecting like baseball cards and comic books (I should write sometime about The Green Lama). A few months later, I had the opportunity to travel to Washington, DC, to attend the Dalai Lama’s conducting of the Kalachakra. I had difficulty trying to decide whether to go, so soon after the humbling I received in California. Was I succumbing again to the temptation to hit a spiritual home run? I seriously doubted my motivations at the time. In the end, I went, and it was a phenomenal decision. 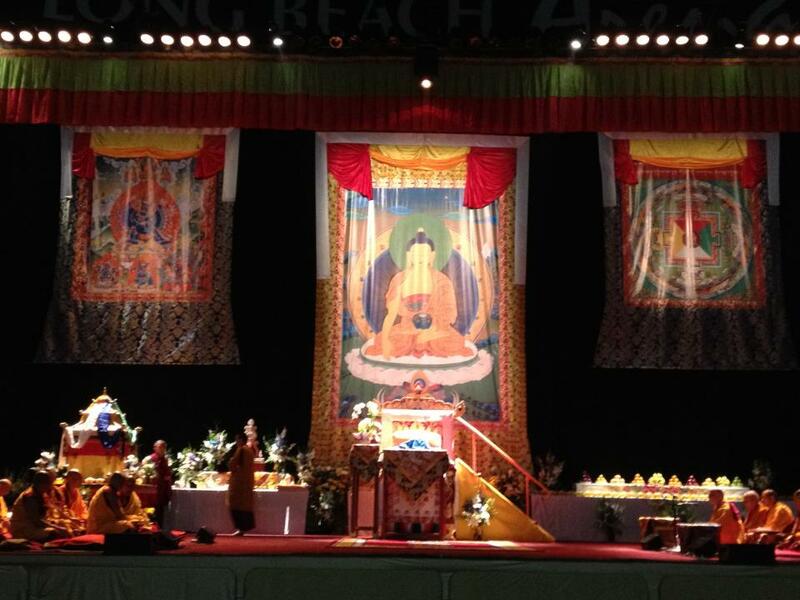 When I received word late last year that His Holiness would be returning to Long Beach to “make up” the initiation he missed, and was invited by the event host to return free of charge, I wasn’t sure if I should go. The experience of the Kalachakra would be very hard to top. And although Gaden Shartse Thubten Dargye Ling would be comping me the event tickets, I’d still have to pay for the flight, hotel, meals, rental car, and so on. I was ready to pass. Then my boss asked me to attend a conference that he and I alternate going to; this was supposed to be his year. The conference was in Las Vegas, practically all the way to California, it was the same week as the Dalai Lama’s return to Long Beach, and my employer would be paying for the flight out to Vegas. I realized I was being led back to California; who was I to kick against the goads. 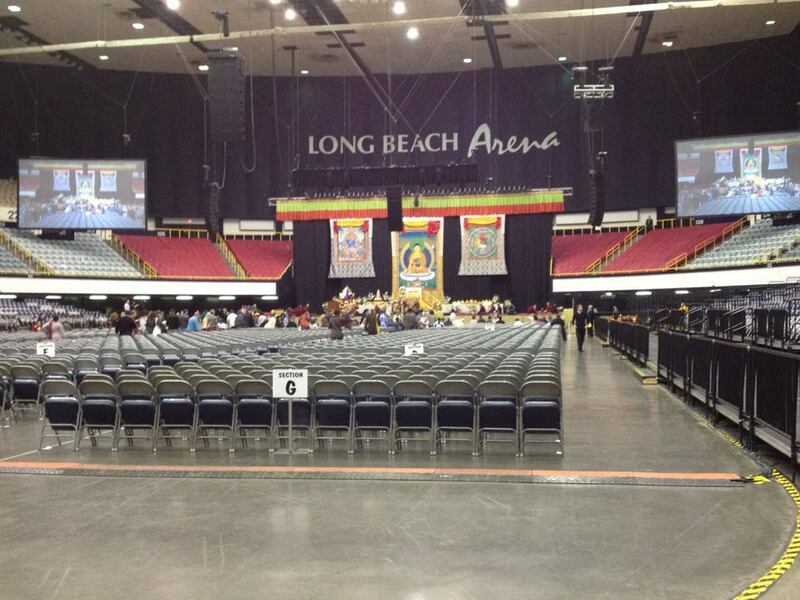 I got chills when I drove into downtown Long Beach Thursday evening, past the convention center where the Dalai Lama was supposed to appear last year, by the Westin where the humble Khen Rinpoche shamed me for my “disappointment” and the wise Robert Thurman put my feelings into perspective. When I checked in at the Courtyard, the desk clerk said he was switching my room to move me away from a large group of noisy young boys. My new room number was 619, which looks an awful lot like a yin-and-yang to me. I took it to be auspicious. Two days later, as I type this, I am still processing the experience of see His Holiness again and participating in the initiation. I’ll write about it soon. In the meantime, here are a few fuzzy photos I took with my phone. Hopefully, there are some better ones on my camera. Most of the time, when you succumb to feelings of anger, it eats you up inside and makes you sick emotionally and physically, but has little or no impact on the person with whom you are angry. I think that speaks volumes about the value (or lack thereof) of anger. As many Dharma Beginner members pointed out, there is some value to anger as a motivator, something to prompt you to act to right wrongs. My former boss used to refer to that as “righteous indignation.” I can see what they’re saying, and I know from my own experience that anger can be useful. 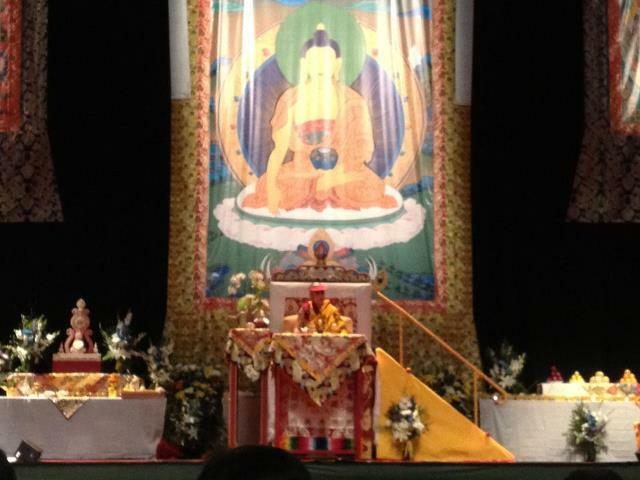 Personally, I prefer now to find my motivation in compassion, in generating bodhicitta. Mindfulness of anger, as with awareness of any emotion, is paramount. To be aware of feelings of anger and be able to ask why are the keys to turning anger into something beneficial. In the heat of the moment, and even for some time afterwards, it is so hard to recognize the lesson, let alone learn from it. So one of the ways in which I can measure my own progress is by observing how long it takes me to “emerge” from the unpleasantness and remember that unpleasant situations are learning experiences. Every once in a while I will remember as the unpleasant situation or experience is still occurring, and that brings joy and helps the unpleasantness to melt away.